Click the hiking logos to open other parts of the country and the towns for further information. Green lines show some of the hiking trails! Vogar-Njardvik. An ancient route through the Reidskard Pass over the Vogastapi Headland and mound Grimsholl. Vogar-Grindavik. This route is called Skogafellaleid (6-7 hours). Vogar-Reidskard-Grimsholl-Snorrastadatjarnir-Habjallar-Vogar. Between the Snorrastadir Ponds and Habjallar the route follows a deep fault similar to the Almannagja in the Parliamentary Plains. 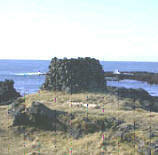 The Cliff (Bergid) in Keflavik. 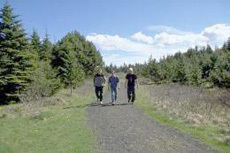 A recreational area with a hiking route to Cove Helguvik. Fitjar_Grindavik. This ancient route is called Skipastigur (5 hours). Hafnir-Hafnaberg. This hike starts at the parking lot by the road and takes about 40 minutes. A short distance from the Hafnir Cliff is the symbolic Bridge between the Continents, which can be crossed and the hike continued to the nearby craters, Stampar. The latest eruption in this area took place in the middle of the 13th century. The Reykjanes Area. There are several hills and low mountains in this area which offer excellent panoramic views on a fine day (Mt Skalafell, Mt Haleyjarbunga, Mt Syrfell). A hike from this area via the crater area Eldvorp to the Blue Lagoon is relatively easy. The Reykjanes High Temperature Area. All together there are five high temperature areas on the Reykjanes Peninsula, and the one closest to the lighthouse is among the most powerful of the country. Visitors enjoying this natural wonder have to be extremely careful within it. The most renowned hot spring of the area is “Gunnuhver”.